Vandal’s Flow WS range remains unchanged for 2016 and comes available in 3 sizes, the 12’6” (based on the IQ Touring) and 11’0” being 6” thick, whilst this 10’0” is just 4” thick. All come supplied with two fins, a pump, carry bag and repair kit as standard and are also available as a complete package option, partnered with Vandal’s excellent Venture rig. The Vandal Flow comes with all the latest features you’d expect of a modern inflatable SUP, including heavy duty leash eyelet on the tail and tow eyelet on the nose, an extended EVA deckpad, US box fin inserts for the fins complete with hand-locking fin bolts and a rope storage system on the deck just in front of the pad. The drop-stitch used is the thinnest on review here, with what Vandal are calling ‘Space Yarn’ in the core, wrapped with two PVC layers on the deck and hull and a double layer on the rails to maximise stiffness and durability. On paper, the Vandal has some of the smallest dimensions in the group and certainly one of the narrowest tails. Nevertheless, for an average weight adult with a bit of experience in paddling, it is perfectly stable and manageable, if not the most natural and effortless at gliding through the water. At 4” in thickness it does benefit from being fully pumped to its recommended PSI and sits lower in the water than others here. For improved glide through the water, Vandal would direct you to the 10’0” Flow’s larger siblings in the range, yet as the wind increased the planted stance of the 10’0” began to show its benefits. Tracking beautifully in windsurfing mode and pushing through chop without cause for concern, it feels secure and assured as you drive more power into it, rising onto the plane if power is maintained. 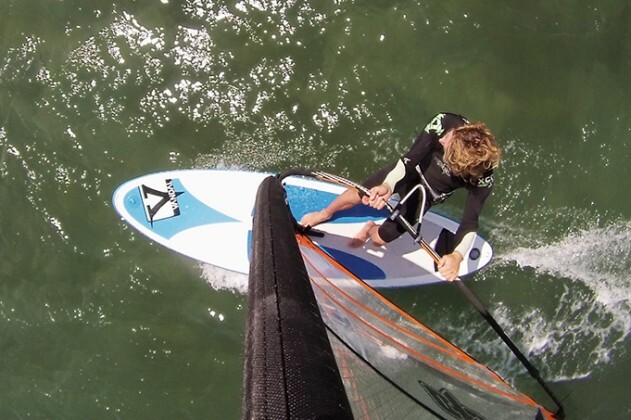 It certainly found favour with the smaller, lighter rider who tends to use smaller rigs and relies on the manoeuvrability of the board as much as the power provided by the sail during transitions. The Vandal’s rounded outline and narrow tail, (combined with its smaller fins) really play their part, its pivotal nature even lending the 10’0” for use in a manoeuvre-oriented role such as in a wave break. Sure, it can’t really compete with the hardboard, its rounded rails having a tendency to slip more often than grip, but it is certainly entertaining to explore that ‘release-point’ in small soft waves and will bring a smile to the user’s face.